… to Gabriel’s long-awaited new album Up (or I/O). Gabriel has no problem doing a soundtrack before the release. 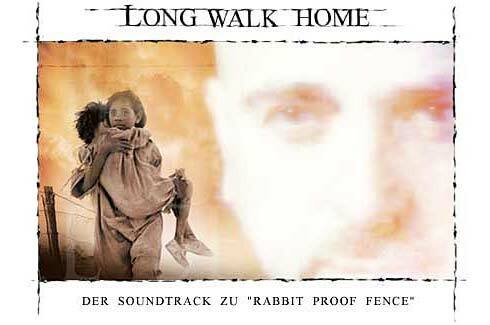 It is called "Long Walk Home – The Music From Rabbit Proof Fence". This is Peter’s third soundtrack after "Birdy" and his 1989 classic Passion. The album is released on very different dates in various regions of the world. It was available in March in Australia while it was scheduled for release in Europe and North America in Mai. Meanwhile the release date has been pushed back to the midde of June. This means that the soundtrack will enter the shops after the remaster series in most parts of the world. Collectors may be interested to hear that the U.S. version has a movie still on its cover while the European release has typical Gabriel artwork. Many things could be heard and read about Long Walk Home on the internet. Gabriel himself called the soundtrack the continuation of his Passion album. There are many layers of music on this album, but no real song or, indeed, any normal vocals. Some of the songs have a catchy choir bits in them instad. Gabriel lives up to his reputation as an experimental musician. He cut loose the commercial ties that certainly exist for Up and he’s quite relaxed drifting through his own world. The big highlight is missing, though, and there are moments when you find yourself thinking that this album is too weird. It requires utmost interest and attention of the normal fan. You may note some similarities to instrumental parts on Ovo and a few rhythmic traces of Passion. The opening piece, Jigalong, reminds one of, say, The Tide Of The Turning from Ovo. Gabriel makes too extensive use of a certain sound. The surprise value is lost. The rhythmic elements are presented in a slow pace. It is interesting to note that the drumparts almost always consist of two different sounds. It would occasionally be good to see the film while one hears the music. Pieces like The Tracker and Go Away Mr Evans appear like they’re left alone, and they probably miss their point. Running To The Rain certainly is a highlight. In its second half it turns into a kind of instrumental anthem. The drums play an important role here. Another highlight is Gracie’s Recapture, a song based on background vocals. Goosebumps show up on an unpronouncable piece called Ngankarrparni. That’s also because the gospel choir at the end is performed by the excellent Blind Boys Of Alabama. Avid Gabriel fans may also know that that part of the track is going to appear in a song called Sky Blue on Up. That’s why the piece is subtitled Sky Blue Reprise. The melody reappears at the final piece, Cloudless, and makes for an emotional ending. The Long Walk Home is over. Long Walk Home does not have the class Passion had by far. It is a fine snack on the way to the next proper album. Its highlights and the previous release, Ovo, make the wait for Up less tedious.